The newly released web add-on (pdf) provides AJAX based search/display/export features using just your web browser. Using Windows + IIS authentication you can make the ACS server log data securely available to anyone in your organisation to aid with fault finding, forensics, capacity planning etc. aaa-reports! 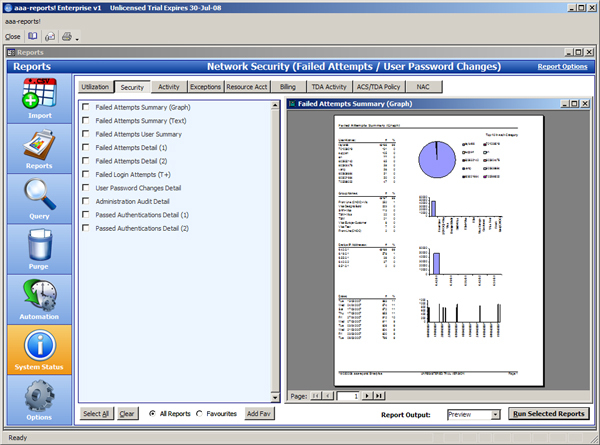 enterprise web provides browser based access to the AAA server log data in an ultra convenient form. Its wizard based approach allows even non-database literate users quickly find what they are looking for. aaa-reports! enterprise web allows for up to five search parameters per report using equals/not equals, like/not like, null/not null operations. Running a report will first display the number of matching records found, and then if desired render the results grid, or allow the user to modify the search criteria. The report results are displayed in a multi-page table with multi-column sorting and page controls. Data can be exported to both CSV and PDF. When accessing the web report application users are authenticated via standard Windows authentication on the server. Additionally users are authorised by virtue of their Windows group membership with a simple XML file rights/roles file used to define the desired access control. aaa-reports! 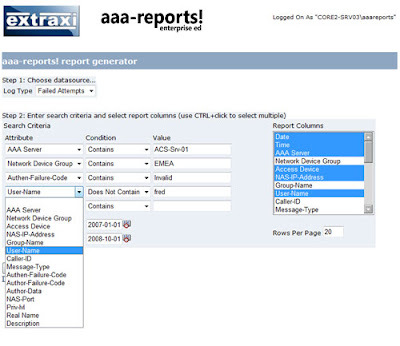 enterprise web is now a standard component of aaa-reports enterprise edition and may be downloaded by existing customers with a valid support contract. Need a hand writing a purchase justification? Click here for our management overview of aaa-reports! Check out our new tips blog..
Cisco, Cisco Systems, the Cisco Systems logo, and the Cisco Arrow logo are registered trademarks or trademarks of Cisco Systems Inc and/or is its affiliates in the US and certain other countries. Other trademarks are the property of their respective owners.